Is there a secret society attempting to recruit the best coder breakers in the world, using clues that spans across the globe and Internet? That’s what some people believe the case is with the elusive Cicada 3301 online puzzle, which, if history repeats itself, will make a return within days. Tekk Nolagi, a teenager from the San Francisco Bay Area who asked not to be identified by his real name, says he was sitting in a high school robotics lab in 2012 with his friends when the photo first appeared on the image message board 4chan.org. Some of the theories about who is behind the puzzle include the National Security Agency, Central Intelligence Agency or a secret society. Some have speculated that the puzzle is a recruitment program or an alternate reality game, where players collect clues, interact with other players and solve puzzles in real life. According to the participants online, when the image was opened in a text editing program, a cryptic message appeared that was interpreted as a Web address. Those who were trying to solve the mystery were led to a website, which in turn led to a Reddit.com forum called "a2e7j6ic78h0j" that revealed a series of symbols and coded messages. Several more clues were uncovered -- including hidden messages that suggested the key to breaking the code was already posted on the a2e7j6ic78h0j forum. Once decoded, a U.S. phone number was revealed. The number, which has since been disconnected, had a message for callers that was yet another clue. This time, a riddle led to a website that had a picture of a cicada and what appeared to be geographic coordinates. According to online reports, posters were found at some of the locations around the world, including Paris, Warsaw, Seoul and Miami. Each poster had an image of a cicada and a QR code that, when scanned, revealed a message. Tekk says he worked with a group of nine active participants and several additional helpers to solve the breadcrumb trail of clues left by the game’s creators. One of the people working with him sent his brother out to see one of the posters, which was located in Australia, in real life. It was a physical piece of the worldwide puzzle that they could confirm existed. “I was in awe and frightened because I didn’t know exactly what the reach of these people were. Imagining they have access to all these different places around the world at the same time kind of blew all our minds. We started getting a little bit nervous in the chat room,” he said. Soon after, the trail went cold and no new clues were release until a year later on Jan. 4, 2013, when a new image appeared on 4chan. Just like the previous year, a similar trail of clues was revealed after the initial image appeared on 4chan, including a sequence of prime numbers, an audio file and a mysterious Twitter account tweeting coded messages. One of the clues post on Wikia led to a bizarre test that was reportedly emailed to participants asked multiple-choice questions like: “I am the voice* inside my head” and “Observation changes the thing being observed.” The choices in answers included: true, false, indeterminate, meaningless, self-referential, game rule, strange loop and none of the above. One of the final pieces of the 2013 puzzle is an email that was reportedly sent to those who passed the test. There hasn’t been much activity since that time, and much of the community following Cicada 3301 anxiously waits for Jan. 4, 2014 to arrive, when a new clue might be posted online. 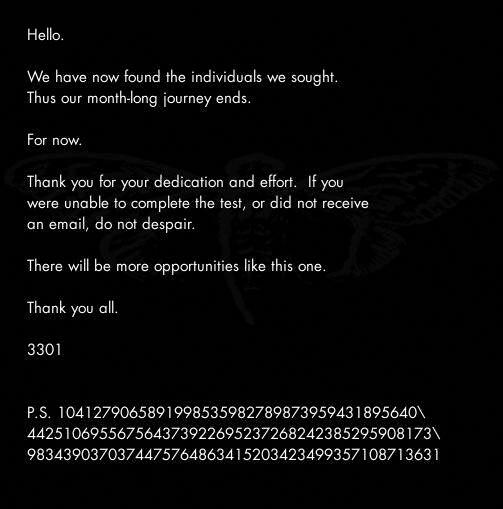 What little information is known about Cicada 3301 has been posted on websites like Wikia and Github, but no one seems to know who is behind the puzzle and what their motives may be for creating such an elaborate trail of clues. Tekk has some theories of what the group’s end game may be, which he says was revealed to him when he found himself in a chat room, of sorts, with people claiming to the organizers the Cicada 3301 puzzle. “It seems like their end goal would be to have some kind of free and open cryptography and anonymity software released to the public, but that’s just a small facet of what they’re trying to do. I don’t think anybody actually knows what they’re going to do from there,” he said.